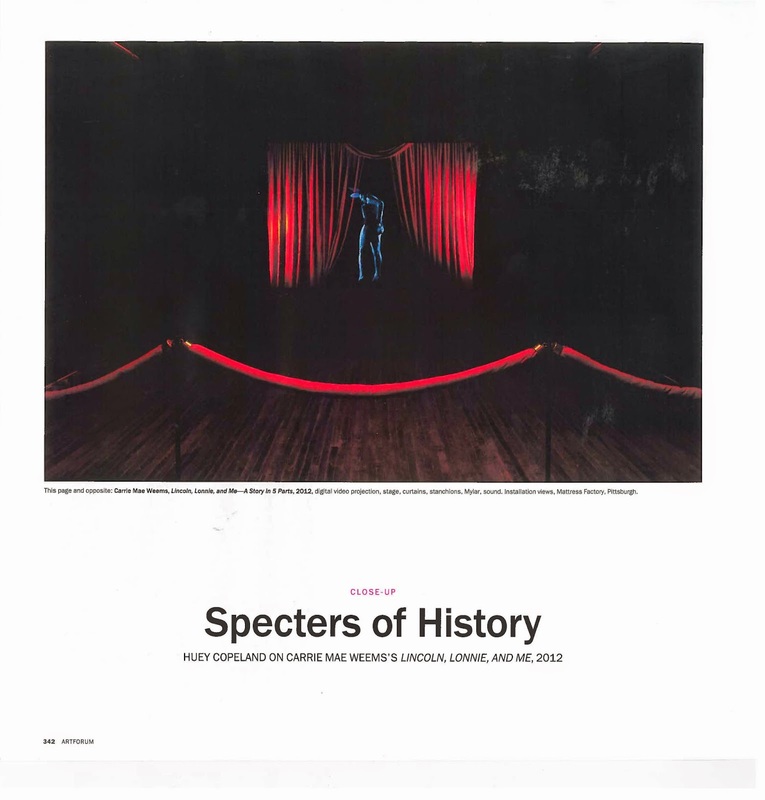 Carrie Mae Weems's work "Lincoln, Lonnie, and Me" was featured in the September 2014 issue of Artforum magazine. 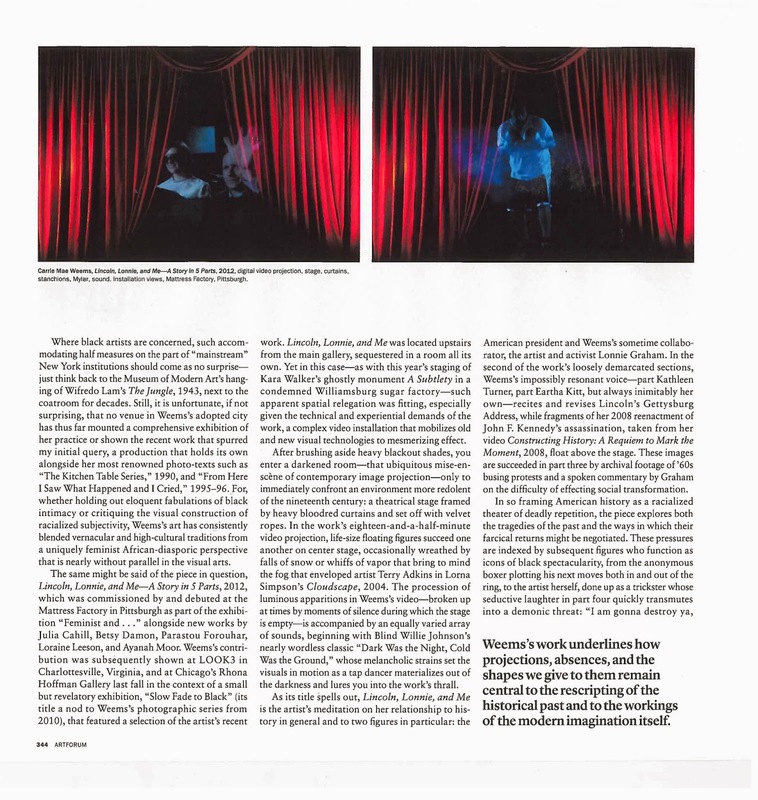 The piece was featured in the "Feminist And..." exhibition held at the Mattress Factory from September 2012-May 2013. Click on the images below to read the full article. August 19, 2014 ARTLab: Penny Arcade! I’m so excited because this week for ArtLab we have Penny Arcade Comedy getting silly in the museum! Penny Performers Tessa Karel and Renee Rabenold will take inspiration from our permanent collection and create improvised scenes right in the galleries. You’ll have a chance to discuss the artwork and witness a one-of-a-kind theater and comedy experience that is shaped by your very own ideas! 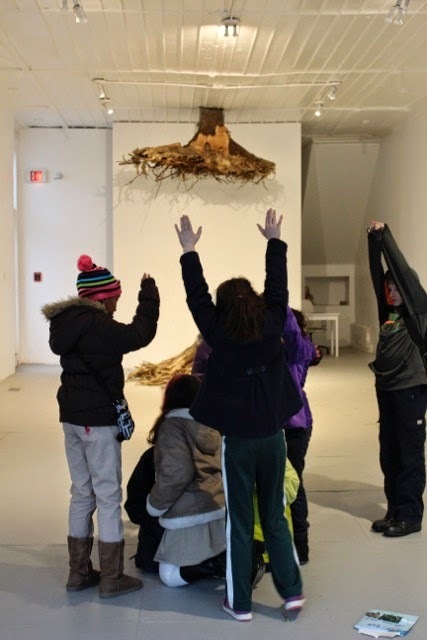 As usual, ArtLab is free with museum admission and is super fun for all ages! Improv comedy is a type of theater experience where an entire show is made up right on the spot. Penny Arcade is a comedy show especially for children and families based out of Arcade Comedy Theater in downtown Pittsburgh. During a typical Penny Arcade show, the audience participates in “collaboration stations” which use crafts to make silly props and costumes and literary prompts like lines of dialogue or character names to help generate ideas that are used in the show. Because the show relies on audience participation, each show is unique! As a museum educator and improv performer myself, I see a lot of connections between installation art and improv. 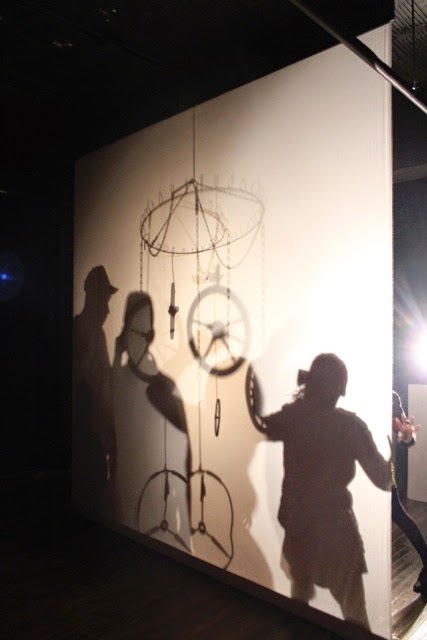 An installation is not complete without visitors walking through and interacting with the artwork, just as an improv show relies on audience suggestions and engagement to give life and energy to the show. Both are site-specific: an installation is created for a specific location and is influenced by the space, community, and context in which it exists, just as improv show is shaped by the ideas that were generated at that moment by that particular audience and group of performers. Once an installation is taken down, it cannot exist anywhere else because it’s meaning and context would change, just as each improv show is only seen once and never seen again, because the chain reaction of ideas could never happen in the exact same way ever again. The ephemeral quality of both improv and installation art is what makes it very special. It also means your physical presence is required to fully experience both installation art and improv. Luckily our permanent collection isn’t going anywhere anytime soon, but the Penny Players will only be at the Mattress Factory for a short time so you better be at our ArtLab this Saturday at 1pm!If you can’t make it this Saturday, Penny Arcade will be performing in The Kids Comedy Cabaret, part of the first-ever Pittsburgh Comedy Festival! The show is on Saturday, August 23 at 1 p.m. at the Stephen Foster Memorial in the Henry Heymann Theatre. The Mattress Factory education department will also be there with an installation activity for audience members to build! The final product will give inspiration to the show! Both the installation and the show will be one-of-a-kind, and once the show is over, it will never be seen again. Looking forward to seeing everyone at the Mattress Factory this Saturday, August 16th and again at The Kid Comedy Cabaret on August 23rd for some art and some laughs! Factory 500 members were out on the town on Friday, August 1 for a private after-hours collection visit at BNY Mellon's downtown offices. Curator Brian Lang toured the group through "Works on Paper by Sculptors," an exhibition organized from the BNY Mellon corporate collection, which features work by MF alumni Kiki Smith and Jessica Stockholder. Brian Lang describing a work by Spencer Finch. Members enjoyed wine tastings with Syma Hajian of Pittsburgh Winery. Syma described several varieties of wine that they produce at the winery's Strip District location. Mattress Factory Archivist Molly Tighe was also on hand during the evening to show off some of the museum's archive records from Kiki Smith's 1997 installation, Flight Mound. Brian and Molly discussed the Mattress Factory museum's Limited Editions program, which features pieces by artist Jessica Stockholder and about a dozen other Mattress Factory artists. Molly Tighe, Museum Archivist, at the Factory 500. In addition, Brian was able to give us some insight into the corporate art world. The group discussed specific works by artists including Spencer Finch and Franz West, methods of collecting, and the rules of buying art for a corporate environment. 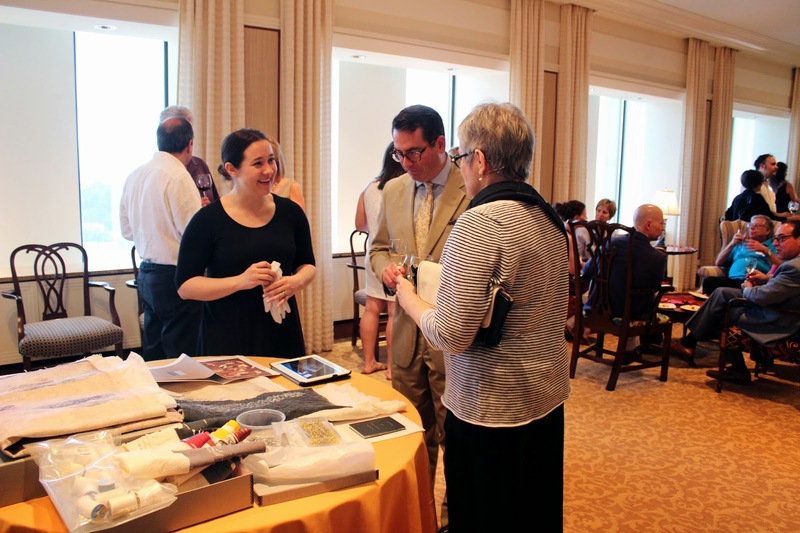 Thank you to everyone who came out to BNY Mellon on August 1st! You can see more photos from this and past events on our Flickr page. Over the past several years, the Mattress Factory has hosted local artists and crafters during semi-annual CraftFactory events. This fall, the museum is seeking painters, photographers, illustrators, sculptors, printmakers, designers, etc. 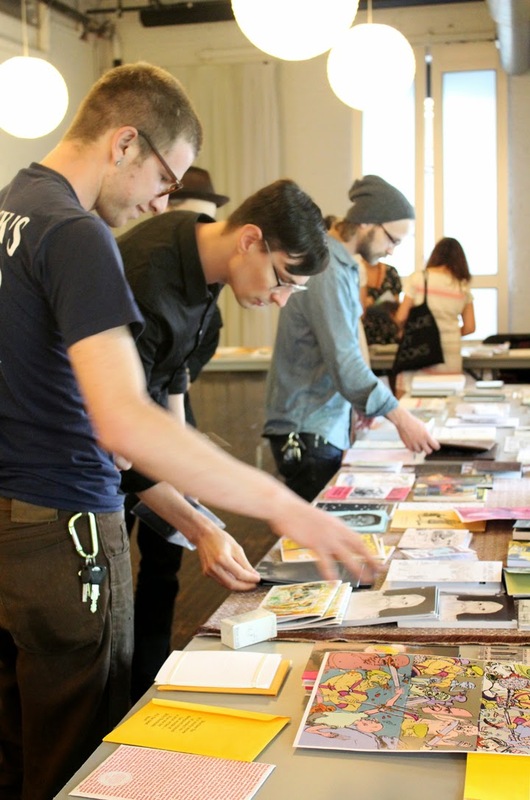 to vend during a pop-up ArtMarket on September 27, 2014. Artists who “think outside the box” and create artwork that may appeal to Mattress Factory visitors are welcome to apply. Prints, framed artwork, drawings, paintings, sculptures and art books are all welcome. Artists are encouraged to offer cards, posters, or reproductions of their work, as we hope to offer a variety of price points. Vendors will be provided with an eight-foot table to display and sell their work to museum visitors and attendees of the ArtMarket. Available spaces include the MF lobby with wall space for hanging work and our tented outdoor garden area. 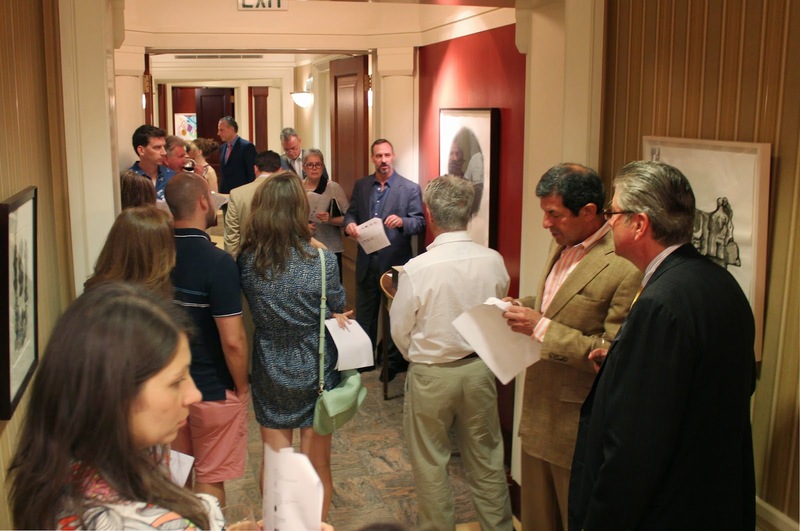 The 2014 ArtMarket will coincide with the Artists in Residence exhibition, on view in the museum’s galleries at 500 Sampsonia Way and 1414 Monterey Street. A panel of MF staff members will select vendors based on strength and style of work. All applications must be received by Monday, September 1, 2014. Artists who are accepted to vend will be notified by Friday, September 5, 2014. Once accepted, vendors are required to pay a non-refundable vending fee to reserve their space - due Friday, September 12, 2014. Detailed information regarding set-up times, Internet access, and other particulars will be emailed to accepted vendors at a later date. Any questions may be directed to shop@mattress.org. 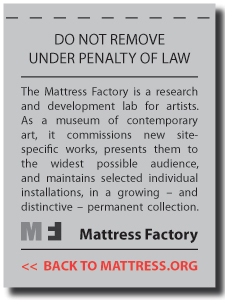 Questions may be directed to shop@mattress.org. This ArtMarket is sponsored by the MF Shop.